Many CMMS program development companies pay a so-called "review company" to "rate" their software. Of course the ratings are always favorable. We reject this deceptive practice and expect most decerning CMMS evaluators can see through this. We rely solely on our users to rate MaintSmart and to provide genuine CMMS software testimonials. Here is the latest ratings by an unbiased, internationally recognized ratings organization. I'd recommend MaintSmart for any company where maintenance software costs need to be controlled through improved equipment reliability and inventory control. MaintSmart is simple to use. Thank you again for being so prompt, yes, the presentations did show what Maintsmart can do. I think this will solve all problems of tracking and record keeping of maintenance on my our equipment. It has just what I need and then some. Hello! We had started using the Maintsmart maintenance management software in our system. Everybody in the engineering was happy of the usefulness of this CMMS software. They can now monitor the downtime, spare part usage and cost. This is a good tool for the department. I looked at a lot of CMMS packages and yours was the best! Thanks for everything. I believe that you have expedited most of our concerns and issues. I will indeed recommend this software to other companies within Jamaica and in other Caribbean islands.I appreciate your time and efforts, and want to reassure you that every help render from your company meant something to us. Let’s work together to let this relationship be a long and lasting one. Thanks again. Thank you for helping us in our selection process for a CMMS solution. Your product has a lot to offer, likely more than we will ever need. When compared to the other products we looked at, MaintSmart, is competitively priced, well designed, and delivers quality information. 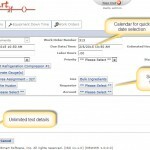 We have selected MaintSmart as our CMMS. Currently our CMMS program is in use in 40 countries outside the USA. Our business has thrived for over 18 years. Some of the reasons for this success is listed below. An experienced maintenance manager with over 20 years of experience originally designed our CMMS program. We listen to our users' suggestions. These suggestions drive the majority of our new development. We designed a system that works for the front line maintenance manager and his team. Our CMMS program interface (screens) are intuitive and consistent with each other. Maintenance managers face a dilemma between logging all data into the CMMS program (such as work orders, preventative maintenance, down time, etc.) themselves or allowing the rank-and-file mechanics to enter their own work. Consequently, we designed a system with user roles and permissions so all personnel have access at some level to the CMMS program. Best of all, this frees up the maintenance manager and give the mechanic a sense of "ownership". We support our software for all users. Email support is free for life. Users with extended support have their issues dealt with very quickly often with online meetings. 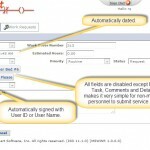 Make the software available to the greatest amount of users through flexible permissions. Although not required, receiving personalized CMMS training gets your organization up to speed with the software very quickly. Automated tasks save the maintenance manager time. Analysis and reporting of all data entered into the CMMS program has the potential to save money in avoidance of lost time, equipment failure, optimized scheduling, optimized inventory and more. Having all members of your organization (not just maintenance team member) using the CMMS program maximizes the value of the program. With role-based permission all member can access the CMMS program at some level. For example, the "Requester" user group provides access for non-maintenance personnel to submit a repair ticket (work request). Restrict some users to only requesting spares with the inventory requester permission setting. Purchase approval levels are usually delegated to managers. Bypass these restrictive permissions where a trusted purchasing agent handles all buying. This creates a system where requisitions are bypassed and the buyer or purchasing agent creates purchase orders directly. Create unlimited and flexible user group/permission combinations to customize program access to exactly what your company needs. Work order templates create new work orders by creating a copy of themselves along with parts lists and any file attachments. 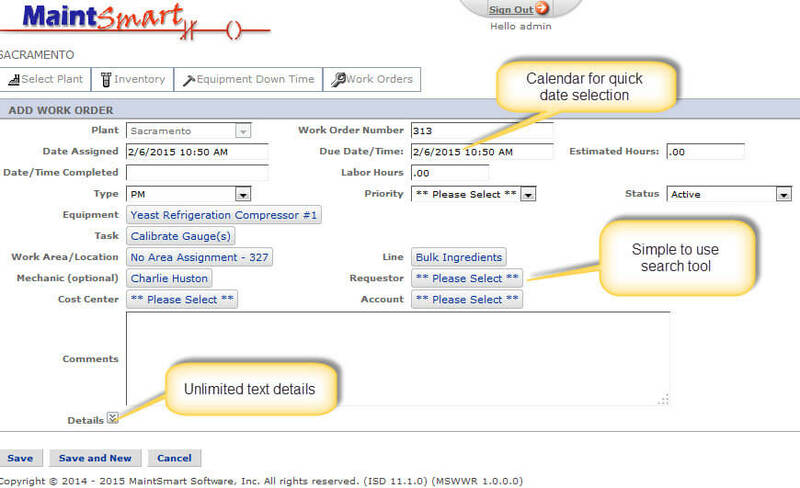 Preventative maintenance task lists are scheduled through the print scheduler and PM software module. This system uses a floating date range. Consequently, the PM scheduler automatically resets itself for the next assignment period as current PMs are closed. Best of all, this is completely automatic. The drag and drop OLAP tool (query-builder) give the maintenance manager the ability to create any data report from any data in the entire CMMS program. It simple to use. Multiple statistical methods are available to apply to any of the data rows or columns. A chart is automatically created displaying the data graphically as the user drags and drops these fields. 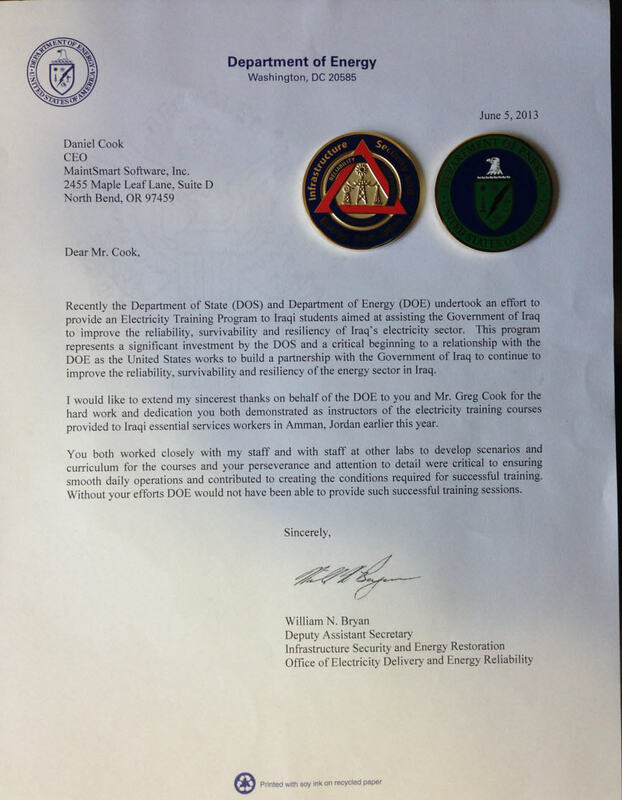 Other money-saving analysis components include the AMSAA reliability analysis (military standard) and OEE (overall equipment effectiveness) modules. All of these modules come with the basic CMMS program package. Unlike our competitors our users receive all modules and complete capability in the form of a perpetual license for one low cost. Yet another reason why our users offer CMMS software testimonials. Create a work order with parts list from a work order template. The web work request module is a extra module that offers web access for work requests (repair tickets), equipment failure data entry and inventory spares search. This gives all users with an intranet or internet connection access to the system. This module is especially popular with organizations such as municipalities, colleges, universities and hospitals where there is a potential for many service requests from many different sources. 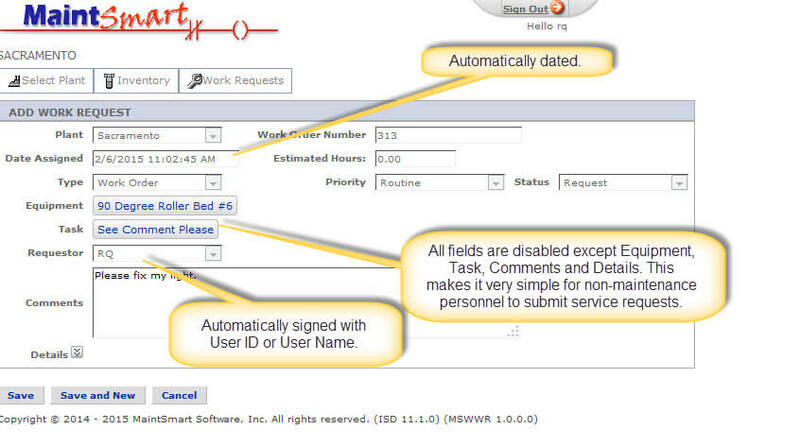 Creating, updating or deleting a work order online is simple with the web work request module. Print work orders from this CMMS module too. Like the main enterprise software version this web module uses role-based permissions from the same database as the main CMMS program.